The following information applies mainly to the operation of the APU's installed on the 737-300 to MAX. For notes about -200 series APU operation, see notes by Jordaan or Ferreira. 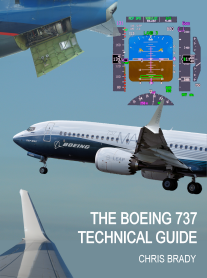 Much of this information is common across all series of 737. 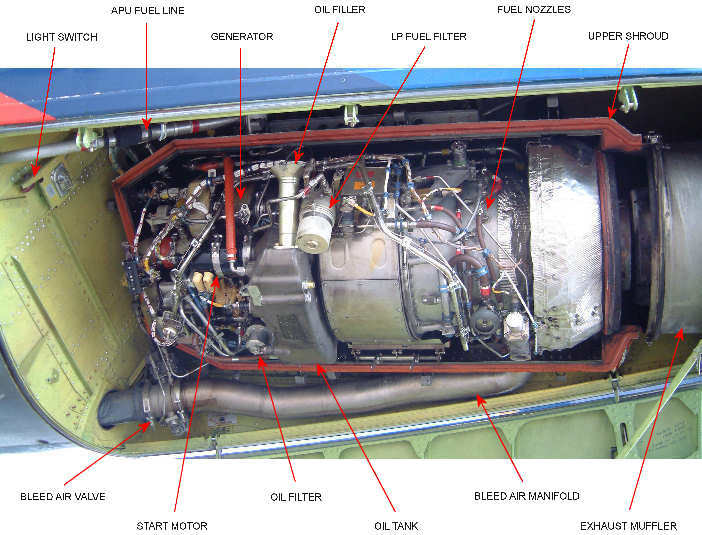 The APU is a source of bleed air and AC electrics for the aircraft, this gives independence during turnarounds, electrical backup in the event of engine failure and provides air conditioning & pressurisation during an engine bleeds off take-off. It's electrical power source is the battery, many series -500 aircraft have an extra, dedicated APU battery to preserve main battery usage. There are many different APUs available for the 737. The Garrett GTCP (Gas Turbine Compressor [air] Power unit [electrics]) 85-129 was standard for the series 1/200 but when the -300 was introduced it was found that two to three times the energy was needed to start the larger CFM56 engines. Garrett produced the 85-129[E] which had a stretched compressor, ie the impellers were lengthened and the tip diameters increased. When the 737-400 was introduced, even more output was required and Garrett produced the 85-129[H]. This has an Electronic Temperature Control which limits hot section temperatures depending upon demand and ambient temperatures. By 1989 the 85-129[H] was the most common APU, although there are actually 14 different models of the 85-129 in service with 737s (see table below). 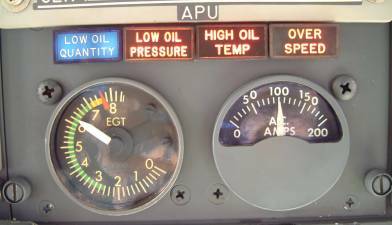 The fuel source is normally from the No 1 main tank and it is recommended that at least one pump in the supplying tank be on during the start sequence (and whenever operating) to provide positive fuel pressure and preserve the service life of the APU fuel control unit. Boeing responded to this need by installing an extra DC operated APU fuel boost pump in the No 1 tank on newer series 500 aircraft which automatically operates during APU start and shuts off when it reaches governed speed. 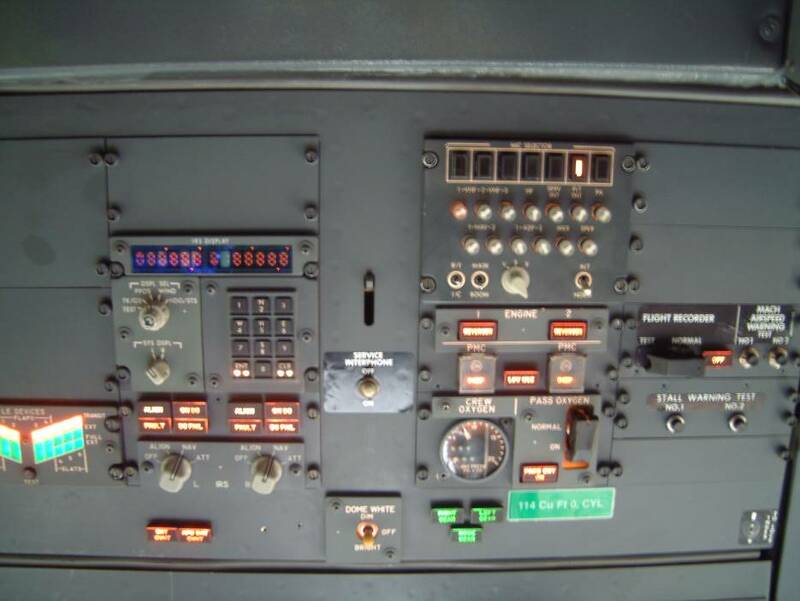 You can quickly tell if this is installed by looking for the APU BAT position on the metering panel and the APU BAT OVHT light on the aft overhead panel. It is recommended that the APU be operated for one full minute with no pneumatic load prior to shutdown. This cooling period is to extend the life of the turbine wheel of the APU. EGT limits marked and oil temp & pressure captions. No EGT limits and MAINT & FAULT captions. Note: NG APU panels do not have an AC ammeter. 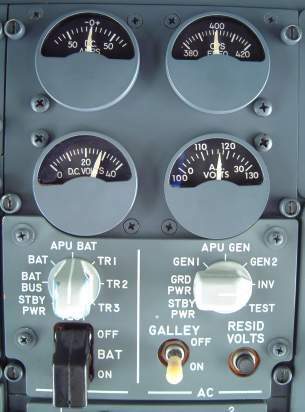 Some aircraft have APU timers fitted on the aft overhead panel, since APU running time cannot be measured by aircraft logbook time. There is only one APU fire bottle, despite the fact that the handle can be turned in either direction! It is filled with Freon (the extinguishant) and Nitrogen (the propellant) at about 800psi. When the fire handle is turned, the squib is fired which breaks the diaphragm on the bottle, the pressure of the nitrogen then forces the freon into the APU compartment which suffocates the fire. Note that after a squib has been fired, the yellow disc on the fuselage may not blow completely clear, see photos below. 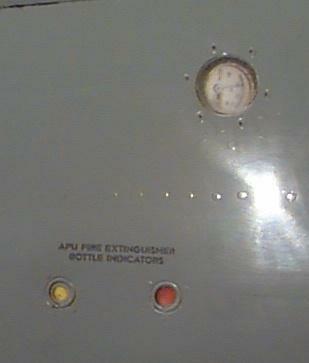 The APU fire extinguisher bottle indicators comprise of one yellow disc to show if the squib has been fired and one red disc to show if the bottle has over temperatured (130C) or over pressured (1800psi). 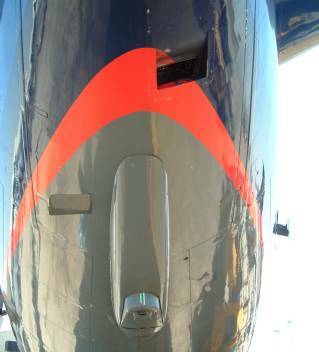 Some aircraft are fitted with the sight glass to the bottle pressure gauge. Note: Sight glass and bottle indicators are not fitted to NG's. This photo shows the condition of the discs after the APU fire bottle had been discharged. Notice how the yellow disc is displaced slightly but has not been blown away, this could easily be missed on an external inspection. Since the bottle only contains nitrogen and freon, there was no other external evidence of the bottle having been used since the evidence had evaporated away. An aborted start (overspeed signal given to shutdown). – Further restart may be attempted. A real overspeed while running. – Do not restart. On shutdown (failed test of the overspeed circuit). – Do not restart. Max recommended start altitude – 25,000ft Classics; No limit NG's. Each start attempt uses approx 7mins of battery life. Classic: Switching the battery off will shutdown the APU on the ground only. NG: Switching the battery off will shutdown the APU in the air or on the ground. The APU is enclosed within a fireproof, sound reducing shroud which must be removed before access can be gained to its components. There are two drain masts. The one just aft of the port wheel-well is shared with the hydraulic reservoir vent and is a shrouded line enclosing the APU fuel supply line, this collects any leakage of fuel into the shroud which can be drained when a stop cork is pushed up in the wheel-well. If fuel drains when the stop cork is pushed, it indicates a leak in the APU fuel line. 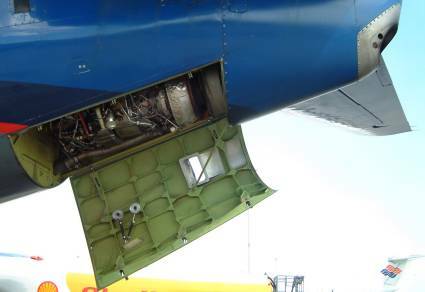 The drain mast on the APU Cowling (see photo left) mates with the APU shroud and drains oil from the forward accessory and the compressor bearing. The opening at the top of the photo is the cooling air vent. 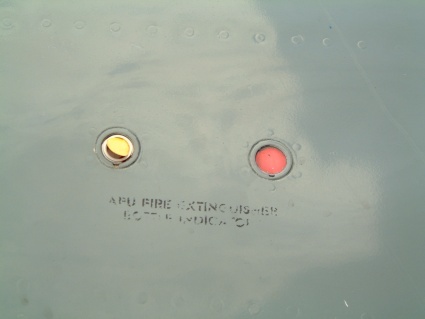 The APU shroud (center), fuel supply line (left), bleed air duct (right) and cooling air vent (outlined in red). Note this metal shroud is replaced by thermal fire protection blanket on the NG. 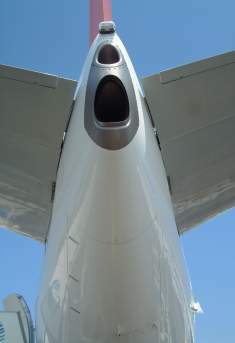 The APU cowling showing the lines to the discharge discs and the cooling air overboard exhaust. The small access panel above the cowling is the line of sight oil filler, this is sometime located ventrally in front of the cowling for easy access from the ground. 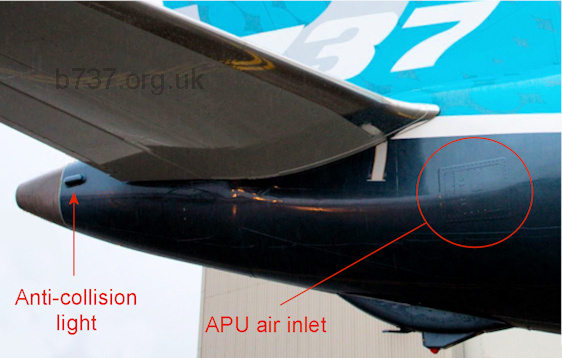 The 737 NG APU is recognisable by the “eductor” cooling air inlet above the exhaust. This and a redesigned silencer make the NG APU 12dB quieter than the Classics. The eductor works by using the high speed flow of the APU exhaust which forms a low pressure area. The low pressure pulls outside air through the eductor inlet duct to the APU compartment. The cooling air then goes through the oil cooler and out the APU exhaust duct below, eliminating the need for a separate cooling air vent or fan. 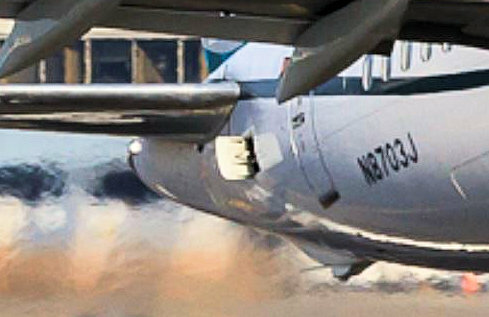 The protrusion on the lower right hand side of the photo is the vortex generator on the APU air inlet door. APU life can be shortened by incorrect operating techniques. This can be helped by allowing the correct warm-up & cool-down times and bleed configuration for each type of APU. They all differ slightly due to engine core and design differences, but the manifestation of the failure is usually a turbine wheel rotor and/or blade separation. The following table is based on manufacturers recommendations. *Initiates automatic cool down cycle. 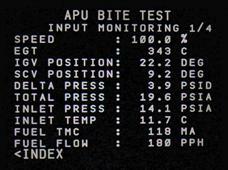 Warm up period: The minimum time to run the APU before a pneumatic load is applied. This allows the turbine wheel temperature to stabilise before a load is applied. Whilst 3 minutes is the recommended figure, 1 minute should be the absolute minimum. Note an electrical load may be used with no warm up period. Bleed Pack Operation: The number of packs to use on the ground. APU's which should run both packs have load compressors to supply bleed air. So two pack operation gives both cooler turbine wheel temperatures and a lower fuel burn. Main Engine Start (MES) to APU shutdown: The cool-down time to allow after main engine start. Note also that there should be a minimum amount of time between turning off the pack(s) and starting the first engine. Additionally, minimum delay should occur between starting the first & second engine. This prevents the turbine wheel temperature from decreasing and then significantly increasing when the second engine is started. 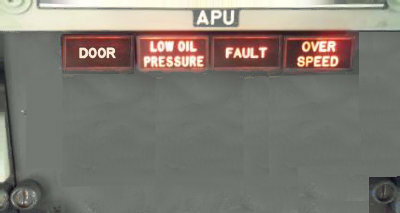 APU shutdown: The cool-down time to allow after flight, after the packs have been switched off. Note, it is important to allow the APU to complete their shutdown sequence before the battery is switched off. A single pack must work harder than two packs to cool the cabin to a given temperature. Hence the APU must supply higher bleed air pressures to assure proper environmental control system operation. This higher pressure requires a greater Inlet Guide Vane (IGV) open position than that required for 2–pack operation. Since there is less airflow required to operate 1–pack than is needed, a significant amount of unused bleed air is exhausted through the Surge Control Valve (SCV). This higher IGV open position and large quantity of unused air translates into higher APU fuel burn and higher EGTs during 1–pack operation. Also, the high airflow levels exhausting through the surge control valve increases the overall APU generated noise by 2dbA. With 2 packs supplying the cabin cooling requirements the pressure requirement is lower, resulting in lower turbine inlet temperatures, EGTs and far less unused air being discharged through the surge valve. The FCOM (7.30.3) and AMM (49-11-00/200) tells us that the APU should be operated for a minute without bleed air before shutting down. This is all done automatically by selecting the APU master switch OFF. However, if the battery master switch is switched off during this minute, the cooling cycle will be aborted causing damage to the APU. Aborted cool-downs result in coked oil at the turbine seal and coked fuel on the fuel nozzle. The coked oil at the turbine seal will accelerate oil consumption. 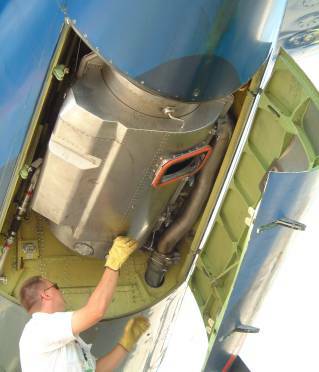 The coked fuel on the fuel nozzle can result in hot streaks through the APU that can cause localized damage to the combustor and the first stage turbine nozzle and accelerates wear through the entire hot section. 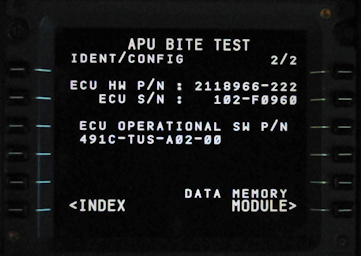 Engineering can identify when this has happened from the FMC CDU as follows: APU BITE TEST IDENT/CONFIG - DATA MEMORY MODULE and look for ‘ABRTCLDN’ (aborted cool down). The MAX APU is still a Honeywell 131-9[B] but is updated to series 41 which has various minor improvements such as improved starting reliability. 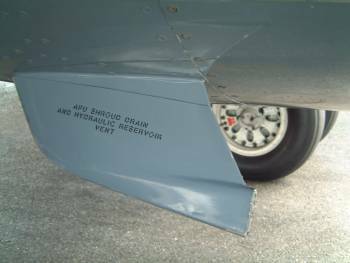 Externally, the tailcone has been extended 43 inches for streamlining; this has enabled the aft body vortex generators to be removed and gives an overall reduction in fuel burn of 1%. The eductor inlet has moved to the right side of the tailcone and the air inlet door has been redesigned with the removal of the NACA duct and vortex generator. The inlet door is hinged at the aft end and opens outward into the airstream, it has three positions: Closed, Ground position (45deg) and Flight position (17deg). Normal door transitions take 40 to 120 seconds between positions. You can despatch with the door locked in the flight position at a 1% fuel burn penalty. The APU fire bottle contains HALON and Nitrogen. There is a customer option for an automatic APU fire extinguisher discharge whereby the APU fire extinguisher will discharge automatically 10 seconds after an APU fire warning is detected on the ground when main engines are not operating. 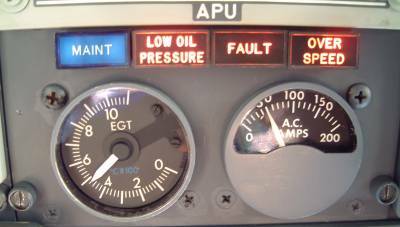 The EGT gauge has been removed from the APU panel on the overhead panel and the blue MAINT light has been changed to an amber DOOR light. Illumination of the DOOR light simply means that the door did not reach the commanded position within 165 seconds. 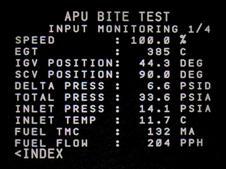 The APU can continue to be used, but some buffeting may be experienced and a fuel burn penalty of 2.4% should be applied. APU OIL QTY - The oil quantity is low but there is sufficient oil for 30 to 50 hours of operation at the maximum oil consumption rate before a low oil pressure shutdown occurs. APU DOOR - The APU inlet door did not reached commanded position in 165 seconds. The DOOR light will also illuminate. Back in 2003 Boeing conducted tests of a Solid Oxide Fuel Cell (SOFC) APU. The SOFC uses jet fuel as the reformer in the proton exchange membrane to give a 440kW APU that is 75% efficient compared to the conventional 40-45% efficient APUs. This could give a typical fuel saving of 1,360t for a 737 over a year. It was actually a hybrid gas turbine / SOFC due to the sudden surges in demand eg engine starts and gear retraction etc. The SOFC would use air from a compressor passed through a heat exchanger for its gas turbine section. The last detailed report I read on this subject, published by Whyatt & Chick in 2012, was assessing suitability for SOFC APU on the much more electric 787. It concluded that the SOFC would have to improve its power to weight ratio by at least a factor of 2 to break even on power produced against the fuel burn to carry its increased weight over a conventional APU. Another potential drawback is that a SOFC has a 40min start-up time, so it would have to remain on for the whole day. Although much quieter than gas turbines, this could still be a problem at airports which require the APU to be shutdown during the turnaround for environmental reasons. The technology for the SOFC APU to replace the current APU is not likely to be available until at least 2020.